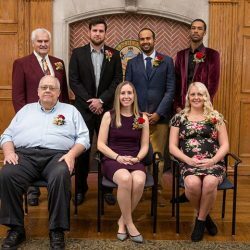 KUTZTOWN, Pa. – Kutztown University inducted its 2017 and 39th annual class into its Athletics Hall of Fame on Saturday, November 11. Seven inductees joined the Hall in front of a capacity crowd at the induction ceremony, held at the Georgian Room of Old Main. Stephen Dennis was the 2010 National Player of the Year and is the all-time leading scorer in KU men’s basketball history. He scored 2,406 career points at KU, third in PSAC history, an average of 20.4 per game. Dennis graduated with eight school-records and led KU to three PSAC East titles and two NCAA Tournament appearances.